Several weeks ago one of my blog readers contacted me and asked if I was interested in purchasing some furniture she was getting rid of. She sent me some photos and quoted a bargain price, so I said sure. She lives about 40 minutes away, which is a bit far but worth it because there were three pieces, and as I said, there was also that bargain price tag. So one Friday night Mr. Q and I headed out to pick up the furniture. We headed straight up I35, took the exit for Wyoming, MN and headed due west down a dark, curvy road with a 55 mph speed limit. One thing I’ve mentioned here on the blog before is that I am a city girl. I like my roads well lit at night, and straight and familiar doesn’t hurt either. I also find that when you are driving on these country roads, the locals behind you get quite impatient if you don’t go at least 5 – 10 miles over the speed limit. You see, they know the road. But I didn’t, so I was driving 55 and being very cautious, using my high beams every chance I got. We made it safely to our destination and loaded up the three pieces, which fit perfectly into our van. Then we headed back the way we came. We were about halfway back to the interstate when we came upon an accident scene. No emergency vehicles had arrived yet, however I could see flashing lights headed our way from further down the road. The roadway was full of debris. There were multiple cars pulled over on both sides of the road and people dashing around. And did I mention how dark it was? We couldn’t really see much, so by the time we realized what was going on it was too late for us to pull over, the shoulders on either side were full of cars. So we kept going, driving very slowly through the debris field. It wasn’t until we were almost through that I glanced over and saw the van that was on its side in the ditch. As I mentioned there were plenty of people on the scene. A police car was responding. And Mr. Q and I have no special skills that we can offer at the scene of an accident. So we just kept on going. We would only have been in the way had we stopped. All the way home we wondered what had happened and whether or not the occupants of the vehicle were OK. It wasn’t until a couple of days later that I learned that some of the passersby had put out a fire in the van using snow. The driver of the van died on the scene. His wife was airlifted to the hospital. There was a second vehicle involved (we never saw that one) and that driver was also airlifted. I really debated whether or not to share this story with you guys. It’s so sad, and I really want my blog to be a happy place. But I’m still feeling haunted by this. Had we been on the road 10 minutes earlier, would it have been us in that accident? My heart goes out to the family that lost a loved one, and I am reminded to be incredibly grateful for the life that Mr. Q and I get to go on living. And also for the reminder to drive cautiously on dark country roads at night, or really anywhere, anytime. If nothing else, I hope all of you reading this will slow down, don’t use your phones while driving, and just remember to treat driving with the respect it deserves. Driving continues to be the most dangerous activity that most of us participate in on a daily basis. So please, be safe. Now let’s move on to happier topics, shall we? I’ve finished one of the pieces we picked up that night and I want to share it with you today. Here’s the before. The mirror is just leaning against the back, but later on you’ll see it in place. I know I broke one of my photography composition rules with this photo, I took it from a standing position shooting slightly downward. But I was trying to keep myself out of the mirror. And hey, it’s a ‘before picture’, so I don’t have to follow the rules for that, right? It’s supposed to look bad. As you can see, the finish is rather beat up. In addition, there is an unseen problem. It was pretty smoky smelling. 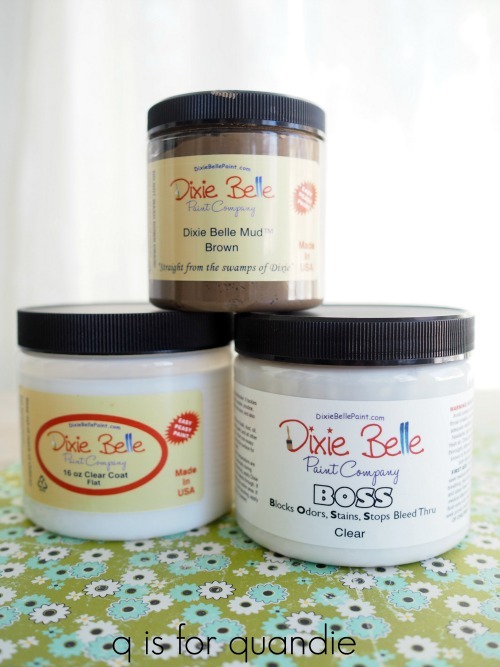 But that just made this a great opportunity for me to try the BOSS that Dixie Belle sent to me a while back. BOSS stands for Blocks Odors Stains Stops bleed-thru. The instructions require two coats of BOSS followed by paint. Logic dictates that in order to block the odor, I have to coat every surface inside and out. To experiment with that I coated the insides of a drawer and then asked Mr. Q to give it the sniff test. Sure enough, he agreed that the inside of the drawer no longer smelled of smoke. However, turning the drawer over, the underside still smelled. So, two coats on every surface. I went through almost an entire 16 oz. jar of BOSS for this one piece of furniture. The jar costs around $18. When you are negotiating the price for a piece of smoky furniture, just remember that the smell can easily be dealt with using this product but be sure to factor in the extra cost if you are flipping the piece to sell. The BOSS leaves a sort of tacky surface behind. Perfect for hanging onto paint, but that also means you must put paint over it you can’t just leave it. So that meant painting every surface as well. 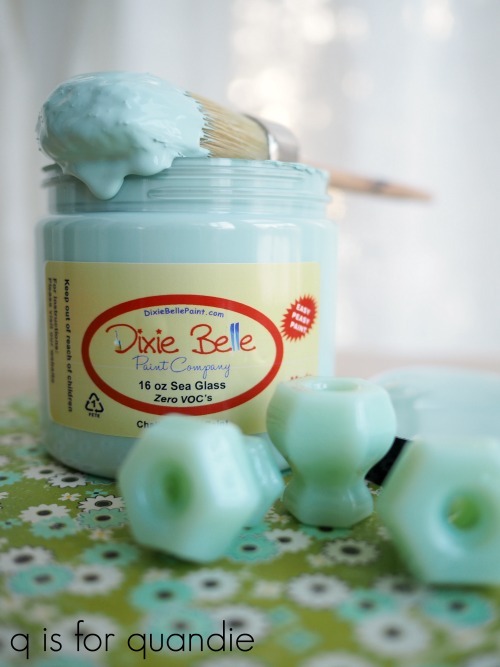 Luckily Dixie Belle had just sent me a fresh batch of paint including a jar of Sea Glass, a beautiful blue green. 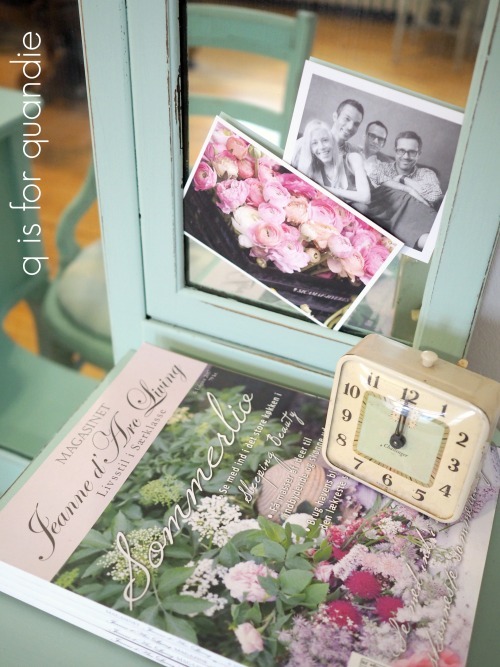 I knew it would work beautifully with some lovely jadeite knobs that I had in my stash. I purchased them a while back from D Lawless. While painting this piece I used the Dixie Belle method of dipping my brush into a cup of water first, then into the paint which basically results in watered down paint. The paint goes on much smoother this way. If you are one of those people who don’t like to see brush strokes, this is the way to achieve that. I used two coats of paint on everything except the undersides of the drawers which only got one coat. 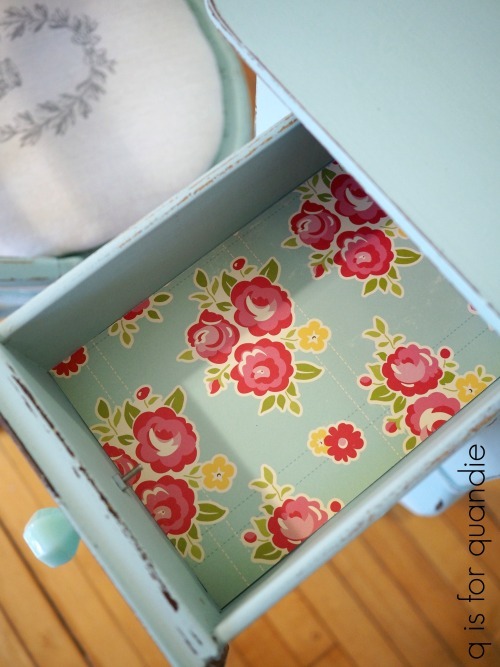 After painting the insides and outsides of each drawer, I also added a topcoat of Dixie Belle’s Flat Clear Coat and then lined them with scrapbook paper. Now, here’s something I learned recently about Dixie Belle paint. You don’t have to put a top coat over it. What? Do your eyes deceive you? No they don’t. It’s true. Once the paint cures (in about 30 days) it is very durable without a top coat. Eureka! This was a revelation to me. After learning that I decided to try a little experiment. As I mentioned, I used the Dixie Belle Flat Clear Coat inside the drawers. I also used it on tops of the two sides. But then I left the rest of the piece as is. I wanted to see if there was a noticeable color difference between the sealed areas and the unsealed areas and the answer is no. At least that’s true with Sea Glass, it may not hold true for darker colors. I’ll have to test that theory further. I like having a little extra protection on the surfaces that might get spilled on, while knowing that I don’t have to clear coat (or wax) the sides, the mirror frame, the legs and so on. The vanity didn’t come with a chair, but once I had it painted I felt like it really needed one. 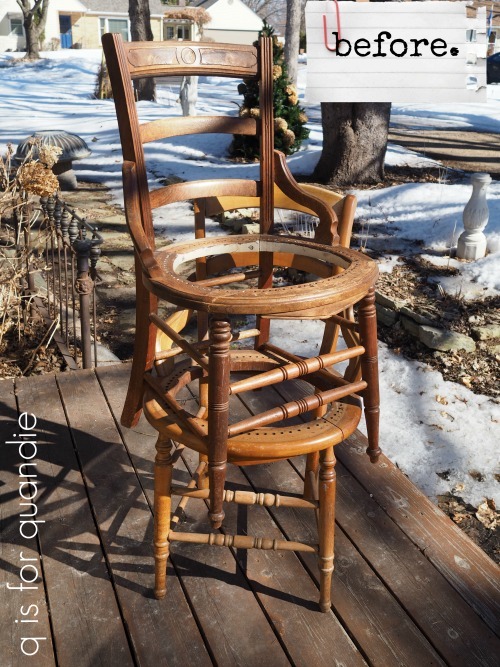 I have a few chairs out in the carriage house, I’d picked them up here and there last year at garage sales. It’s good to have single chairs handy to pair up with desks or vanities. I used the top chair in that stack and I asked Ken to cut a piece of hardboard that I could upholster for the seat. 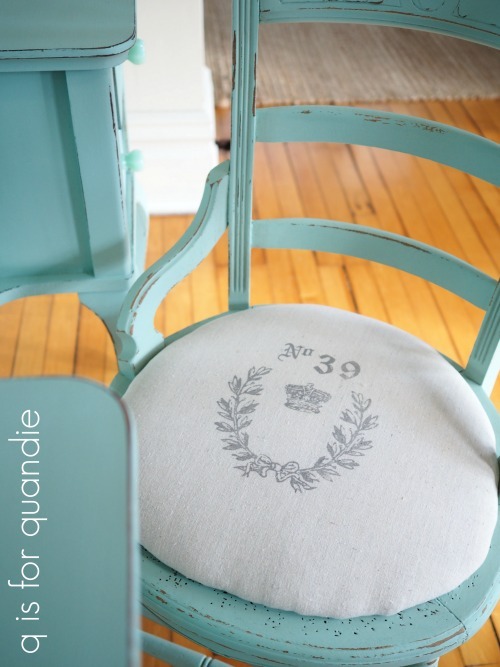 I painted the chair itself in the Sea Glass and upholstered the seat with some simple muslin fabric that I stamped with the Iron Orchid Designs Decor Stamps (see this post if you’d like more details on how to do that). By the way, getting photos of pieces with mirrors straight on without getting yourself in them is tricky. The angle was a little bit easier. I staged this piece with a bit of pink which I thought looked very pretty paired with the Sea Glass. 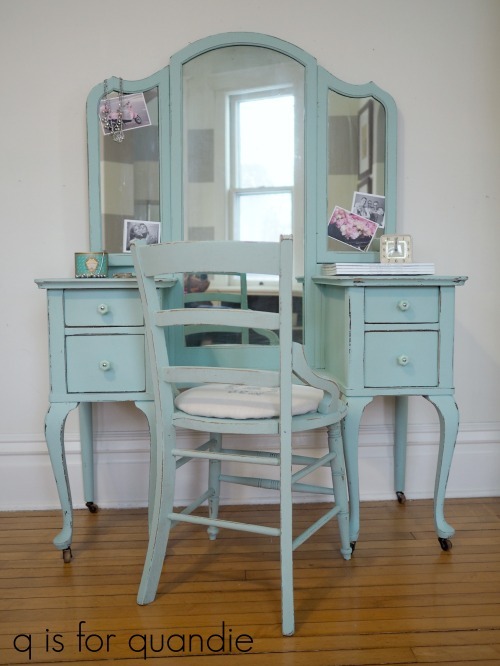 This lovely sea glass vanity is for sale locally, so be sure to check my available for local sale page for more details. Previous kiss me I’m Irish. I’m really sorry to hear that story. I think your intuition was also playing a role telling you to be cautious. So many distracted and impatient drivers. Very sad, and a very good reminder. 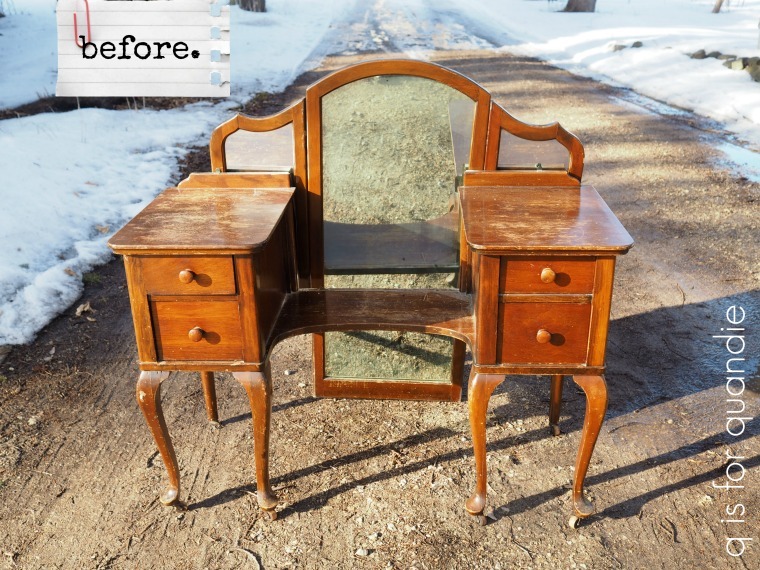 Like you said, on to happier things…soo the vanity is now a thousand dollars? 😉 Sounds like an awful lot of woman hours into it! It’s nice to know there are products that work, but coating every surface is such a task! It turned out beautifully. 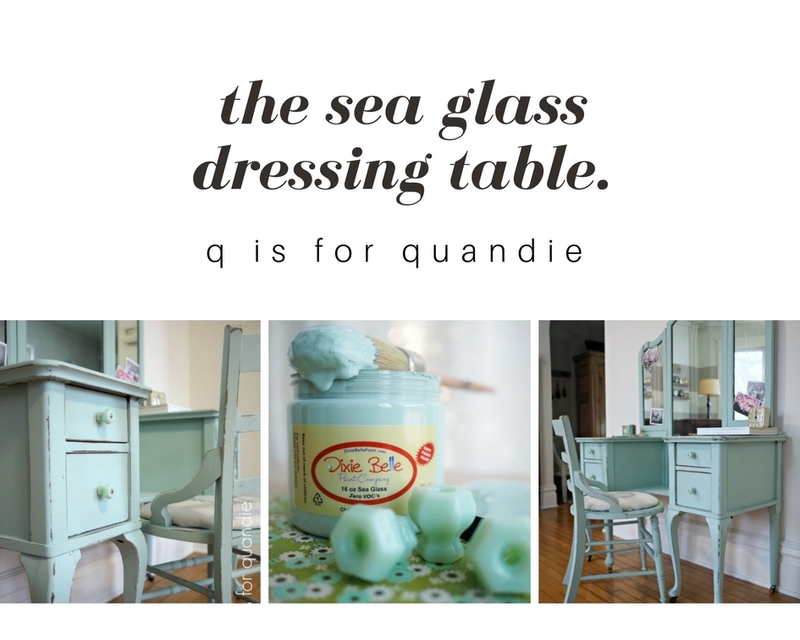 Love the jadeite with it. Again with the timing, this looks very Easter/springlike, and by that I just mean bright and fresh! its very sad to see such horrific things happen to others …and even if we are not involved, we can have vicarious trauma. It’s important to share feelings and emotionally reach out to others. Your reminders about driving safely will help us all to be more in the moment while behind the wheel. As always, I am so inspired by your work. I really want to try this paint. This piece looks so pretty. Thanks Janice! I do like working with the Dixie Belle paint, and I love the fact that you don’t have to put a topcoat over it. I live in a rural area where the driving is just as you described. Most of the fatal accidents happen on two way roads where one driver is in the wrong lane. It scares me to no end to drive on them in the dark. Seeing the aftermath of the accident sure puts a heavy heart in you, doesn’t it? Now on to the beautiful vanity. You definitely put your time in on that project. I love the color, the knobs and the staging. 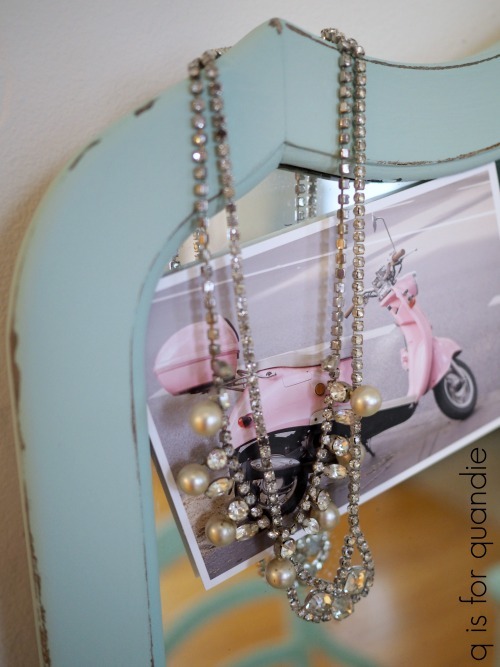 I can see this in a guest bedroom in an alcove with good lighting so you can pretty up before the big night out. As usual you have created a beautiful piece of history and a charming vignette. Happy Monday! I can exactly picture the scene you created in my mind’s eye. Would be lovely! I don’t know if I have mentioned it before but I am a retired nurse. I spent many years as a flight nurse and spent many years at trauma scenes. I can tell you that if you come upon an accident where there is no one, and can be supportive then stop. If you can’t do anything in the way of helping, you were right in driving by. The best thing people can do is get out of the way so that emergency vehicles, aircraft, and teams can get to the accident site. So many times “lookey loos” get in the way and it makes the trauma teams job more difficult. May God bless the people who were involved in the accident and their families. The vanity that you painted is lovely. I love the color. I am a fan of beach glass and I have a jar of glass that I have collected from the beaches that we have visited. I also love the jaydite knobs. Thanks for the information about the BOSS. I have struggled with smelly pieces as have many. Thanks for sharing. I meant to ask you if you had a preference on the stapler and stables that you use in reupholstering pieces? First, I don’t have an official upholstery stapler. I did buy a fancy cordless staple gun a few years ago, but somehow I can never manage to keep the battery pack for it charged up. Every time I need to use it, the thing is dead because I’ve forgotten to put it back in the charger. So I just stick with my basic cheap $20 Craftsman All Purpose Stapler. It works for the amount of upholstery work I do. It’s beautiful! I love the color! That road has had many many deaths since we moved out there 9 years ago. Like double digit numbers. Most of the offenders are people who do not live off the road, as we all know what has happened in the past. A lot of the deaths also involved drunk people. That said, we still love the area and the stillness. Thanks Susan, the Sea Glass is really a gorgeous color! I also live rural and completely understand the driving you have described. A good reminder to us all. Sad though you witnessed what you did. The vanity is beautiful and thanks so much for the tips on “smoky” furniture. I will search out BOSS to have on hand.The colour gives hope for spring! Hi there…you did the right thing by not stopping,I some cases when people stop they are then involved in the accident,unless you have some training keep on going. 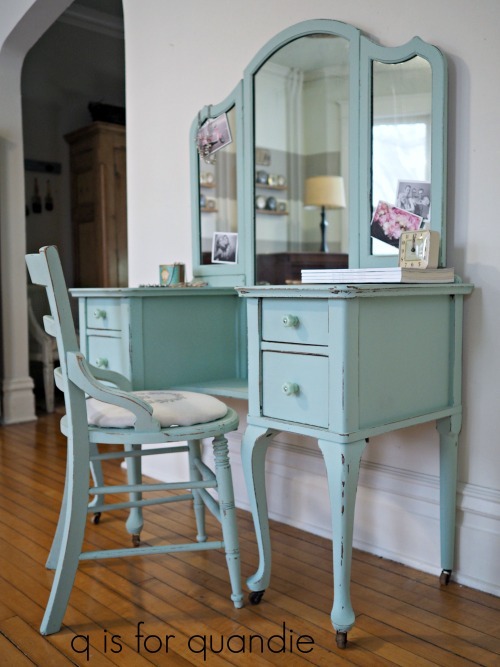 That green dresser is beautiful (even if it is scratchy)love the colour. I could just sit there and put on my face every morning. Have a good week from Betty up here in Ontario,Canada. Love to Mom and Sis…and you too. So happy to see this post as I’m going to buy the mud this week and now will be buying to BOSS too. You always inspire me to do a better, more thorough, job of prepping and painting. Thanks for doing such a great job of demonstrating your work. I used the Dixie Belle mud to fill a big crack in one of the legs on this piece, but neglected to get ‘before’ photos of it so I left it out of my post. I am loving the mud and highly recommend it for filling cracks, etc. One big tip I read about the mud, don’t rinse your hands or tools after using it allowing it to go down the drain. I live in a house with 1904 plumbing so I am following that tip religiously. Instead, I wipe my hands and putty knife clean with a damp paper towel and toss it in the trash. Well, truth be told, I don’t think I’m calm and steady at all. I do fret about the decisions I make along the way, and I am definitely not always confident about my pieces. Just ask Mr. Q. But that all being said, what I do know from years of experience is that you can fix almost anything that goes wrong. Stencil isn’t centered? No biggie, just paint over it and try again. Brush strokes? Mostly I don’t worry about them, but if for some reason they are really awful, sand them down and try again. 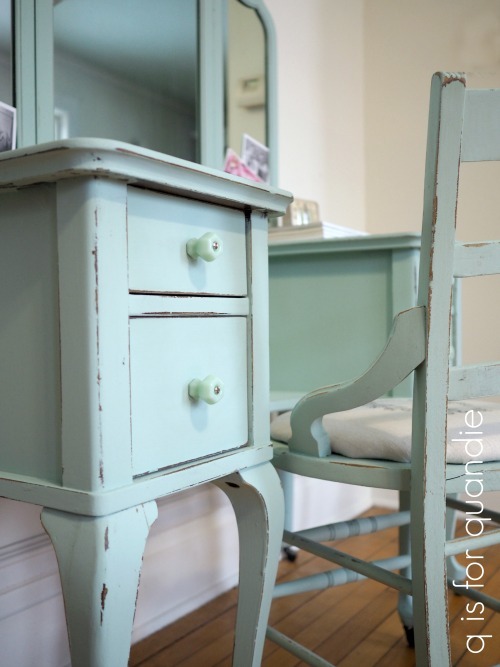 Milk paint color is not consistent, time to start over from scratch. IOD transfer didn’t work out over a dark color, sand it down and paint over it. Clear coat drew the red stain through your chalk paint, paint over it and try again. My biggest piece of advice when something goes wrong is to walk away for a bit, forget about it, then come back refreshed another day and start again! Your road trip story brought to mind a similar experience we had when we lived in the mountains. Our commute to work was close to an hour a day. But the beauty of the area was worth it. One beautiful weekend we were passed by a young couple going an outrageous speed. It wasn’t long before we came upon their crashed vehicle upside down, off the road. No survivors. So sad especially when in all probability it could have been prevented. Reminding folks to be cautious drivers is always needed. Your vanity is precious. Love those knobs and that you lined the drawers. I picture this in a little girl’s bedroom with soft pink walls. I picture the same! Perfect for a young girl’s room. Wow, these are so gorgeous. Love, love the colour. Thanks Ann, it is a beautiful color! Love DB Seasglass! Such a beautiful color! So glad you and your husband are ok! Just reminds us how precious life is and we should never take it for granted! I agree totally, I try to remind myself not to take life for granted all the time. When reading your post about going west on that road out of Wyoming MN, I can tell you I know that road very well. I used to live six miles west of Wyoming just a little north of that road on Martin Lake. I commuted daily to St Paul for my job and spent many a harrowing drive on that road. Even knowing that road like the back of my hand it scared me everyday and I was so glad when we moved. I now live in Oakdale and only have a short 5 mile commute to work. I am glad that you were not the one the road got that day but I am so sorry that it took another soul. I love all your pieces! I have not been in my workshop since I got sick in December but am hoping that the warm weather (if it ever comes) will inspire me! I bet you are enjoying having that 5 mile commute. It’s amazing how much you can do with that extra 60 -90 minutes per day that you save not commuting so far, right? It is wonderful, when I was living up there my children were young and I had to run them all over in addition to the commute, my daughter would have a game in Linwood and my son would have one in Scandia at the same time! I lived in my car! I now have much more time for garage and estate sales! What a beautiful makeover Linda! I do hope in time you can forget the nasty part of that day in time. I’ve experienced similar and it rocks you to the core and is burned into your mind for a long time. Thanks so much Hayley, and you’re so right. I needed a soothing and calm color on this piece!